The Spanish Brown bear foundation, Fundación Oso Pardo, has released figures of the illegal snare traps its patrols have removed in the Cantabrian mountains. Although the numbers have declined since they started their patrols, the figures are still alarming and continue to be a threat to the bears’ survival. These lethal wire traps are set mostly to trap wild boar and deer that cause damage to crops, though some are laid just for trophies and meat. 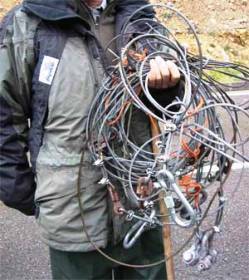 Of the 1,155 snares discovered, most were found in Asturias. In 2004 the total found amounted to 225 but 2007 saw the figure drop to 67. However, in the area of Ancares, on the borders of Lugo (Galicia), Asturias and León, 130 have been removed in the last 5 years by one of the foundation’s patrols and, in the same area, 63 snares were found in the days between Feb. 27th and the 1st of March this year. These figures are without taking into account the snares removed by Fapas who are also working in this conservation area. It is hoped that continued education and intensive searches will see figures drop further. Sadly, due to the obstacle of not being able to provide proof, most cases go unprosecuted. According to the newspaper, La Voz de Galicia, there is hope among conservationists (and conservation-minded locals) that the bears will begin to recolonise parts of Galicia.